Burning Man is inspiring, exciting, and innovative, featuring new wonders every year and a wealth of constantly expanding knowledge. But Burning Man is also big. Very big. It occupies 4,400 acres of the Black Rock Desert Playa, and the main area is seven square miles. The sprawling camps and installations are connected by 60 miles of desert roads. When it comes to getting around at Burning Man, you need a bicycle. And to be ready for the demands of the Playa, there are some essential accessories to consider. Here are ten of the best bike accessories (plus a bonus one) to ensure a great burn. You will be doing a lot of riding at night, so a good light is crucial. There are a lot of good choices, but the Bright Eyes 1200 stands out because for the price and size, it is one of the brightest lights available. It is also easy to snap off when you park your bike and can be affixed to a helmet. The batteries have a long charging capacity and can be recharged with a portable solar charging station. Did we mention that reliable lights are crucial? So crucial in fact, that it is a good idea to have a few. A lot of solar-powered headlamps and bike lights have come on the market in the last few years, but most of them, unfortunately, are poorly built, don’t hold a charge well, and are generally dim. While not strictly a bike lamp, Goal Zero’s Torch 250 is our favorite solar lamp on the market. It is durable, efficient, and compact. Keep it in direct sunlight during the days, and it will brighten your nights. 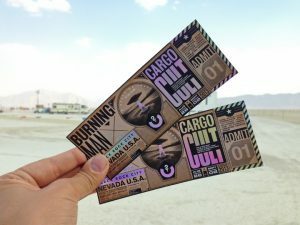 As inspiring and enlightening as Burning Man can be, anytime you have 70,000 people in one place there are bound to be a few who are up to no good. It is a bummer, but bikes do indeed get stolen at Burning Man, so a secure lock is essential. The Illuminated Cable is tough, lightweight, and the LED-lit tumblers mean you can see your combination even on the darkest or dustiest nights. A combination lock is preferred to a keyed lock. Keys get lost and keyholes can get jammed with sand and grit. Just be sure to write your combo down in a few places such as inside your tent. This compact, durable mini-pump and repair kit is easy to use, easy to carry, and a favorite of all kinds of riders. You’ll never be stuck out on the Playa with a flat, and you’ll be very glad about that. The sand and dust storms that can overtake the Playa at a moment’s notice are legendary. Riding through one can be an overwhelming, not to mention blinding, experience. A good pair of sand goggles comes in handy, and Oakley makes some of the best on the market. For price, durability, and quality the MX Sand Goggles are a great choice. Another great energy source for your bike’s lights is this nifty 12 volt/ 6 watt generator that turns your pedaling into power. It provides enough power to run a headlight and tail lights and is one of the more reliable ones on the market. When it comes to riding on sand, a bike with fat tires is the way to go. Whether a cool beach cruiser or a tough mountain bike, the fatter the tires the better the ride you will have on the Playa. Whatever your set-up is, add these tube protectors in your tires and reduce your risk of flats. If you had to choose just one thing to do at Burning Man, it would have to be: drink plenty of water. It is the desert, it is hot, and if you become dehydrated, the fun is over pretty quickly. CamelBak is still the leader in hydration packs, and the Rogue model is high-capacity while remaining lightweight. Be prepared to make any necessary repairs on your own bike. A great multi-tool is essential to keep your ride alive. Crank Brothers makes one of the best tools available. Compact and durable, this multi-tool has 19 functions covering all common repairs. While not strictly a bike accessory, the Tread Bracelet makes perfect sense for the rider who is prepared for anything. This wearable tool covers 29 functions serving as a screwdriver, hex drive, box wrench and more. It is also backed by Leatherman’s industry-leading 25 year guarantee, so you will still be rockin’ it at Burning Man 2042!